I’m not a big fan of warm drinks, even in the winter. In the summer I drink way too much iced tea, and in the winter iced coffee is my daily staple. Even though we are only half way through February I’m pretty much sick of iced coffee already. 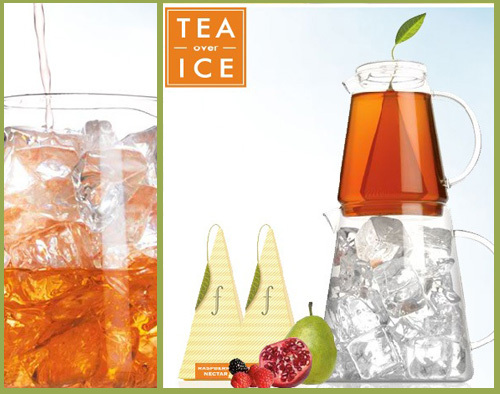 I’ve had my eye on this awesome iced tea pitcher for some time now and think I may actually get it this week. Tea Forte makes these amazing pyramidal tea bags and their iced tea pitcher is a little work of art in itself. I think its time for a little taste of spring, even if there is still snow on the ground. 2 Responses to "GOODBYE ICED COFFEE hello iced tea"
I bought one for myself for Christmas and I’ve used it every day since I received it. The pitcher makes one very large glass of iced tea or two sm/med sized ones. The small pitcher works well to hit the water in the microwave (just don’t put the bag in – the ‘stem’ is actually metal). It turned out to be an excellent purchase for me – even in the cold winter months. I’m so glad you appreciate an iced drink in winter! People always look at me like I’m crazy when I drink iced coffee during the winter – why!? I don’t like hot drinks! I’m thirsty! Hot drinks don’t quench your thirst. Also – people still drink soda with ice during winter, and no one finds that weird.